Fishermen from Rostov region, Russia have caught strange creature from the local Azov sea. They were so shocked about the creature, it was moaning like a human, not as fish, weighed 200 pounds and was rotating its eyeballs. The video above was made by one of the fishermen made a video record of the creature, using his camera phone, little by little the video clip has been shared between people of Azov town in Rostov region, and have reached Internet. When people from news came to the city to learn more about the creature fishermen told them that they… have eaten (!) the creature and admired its taste. It’s not a fake, we eat this kind of ‘creature’ often here. It grows in Amara lake also, somewhere near Bucharest/Romania. We locals call it cealaboashe. Its taste is sure much better than hamsters. Hamsters, you mean those small furry things that look like mice? You don’t really eat those, right? everyone knows, you don’t put hamsters in your MOUTH. . . they go in the other end! Yeah how much do we know whats there deep inside the sea? These are the aliens that live deep in the ocean in their underground cities and they only come out to fly above our heads and mock our primitive technology. Or it could just be a fish that mutated from all the radioactive waste in the water. Very interesting. Too bad they ate it. Looks almost humanish. It does look a little humaish. If that thing was on my rod, I would have quickly cut the line and gotten away. It is a ray, or a skate: http://en.wikipedia.org/wiki/Ray_fish. They do indeed look very strange from underneath. My friend Jim once caught one off the Pacific coast of America, and says that it made a loud moaning or howling when it was hooked, not a noise he had expected from a fish at all. If it is indeed a Stingray, that is the same thing that killed Steve Irwin. I have seen the tops of these while diving. Check this out: http://en.wikipedia.org/wiki/Skate, It’s an endangered species. That’s all because of American pollution! We’re always told that it is because of the Chinese and Japanese fishing industries. Hey did you guys ever see the episode of the Munsters when Herman gets caught by a Russian fishing vessel off the coast of California? That was a funny one! Just a bit of a one track mind eh? Whats the weather like there? Its nice and warm here. Now that is strange indeed. Hmm no physical evidence? Fishy. Not impossible though. We only know of a small fraction of the sea creatures in existence. If the eyewitnesses seem credible, it’d be worth digging through the trash for any alleged bones. THE FACE LOOKS LIKE A HALOWEEN MASK MADE OUT OF RUBBER. It’s not a skate, you dopes. It’s a sturgeon. This is a 100% sturgeon, filmed from beneath. FYI: sturgeon and belugas are where black caviar comes from. The eye-like holes are the gills… The eyes are on the other side of the fish’s flat head. Its not a sturgeon, looks nothing like a sturgeon. Its not a sting ray either, but its a member of the ray/skate family. Sting rays have long thin tails. It looks very similar, though larger, to some I used to catch in california. I never found out the actualy name of what I was catching though. Ok as a marine biologist, I will settle this very simple issue. The fish in the film is a species of beluga (sturgeon) (can’t tell which one, there are a number). They’re very common in this area and it is indeed where the exquisit black caviar comes from. As Alex pointed out, what looks like the ‘eyes’ are the gills, the fish is put upside down on the table. The eyes are on the other side. There’s nothing fake about the fish, what is fake is that these fishermen would be surprised about it – they make their living off of it. However, since the beluga looks so weird and human-like from underneath I can see why someone thought it would be a nice prank. Its not a guitarfish nor any kind of ray. Rays only populate the oceans, not lakes. And for those of you who say that you’ve seen something similar in the US, let me tell you that the US and Russia hardly have any species of fish in common. Belugas for instance, are found only in Russia and former USSR republics. End of debate. Whom are you kidding. I live in US, but my grandma lives on Azov sea, and let me tell ya that the real strange creature would be a “fisherman with a camera cellphone” They are so damn poor, my grandmas house is one of 3 on the block with a landline! The whole thing is a hoax. That’s a Guitarfish, the Russian name for this fish is пятнистый гитарный скат. Haben Fischer einen Urzeit-Fisch aus dem Asowschen Meer geholt? I agree with you its a guitarfish, i work on a pier in florida and 5 of the local fishermen said the same thing. Mermaid, yeah…. from Delta Quadrant. This is a fake, very bad fake.. It is a form of stingray. I’m Indonesian. That video had ever been very popular in my country and the sound is Indonesian. Seeing it again here… I just can say it’s FAKE. For the story is different. Its an endangered member of the ray family known as the Giant Devil Ray or Eagle Ray, “Mobula mobular” mostly found in the mediterranean. It appears to have dried up a bit, probably why it was moaning. And by complete coincidence, I decided to look up the name of a fictional airship from the book Mortal Engines. 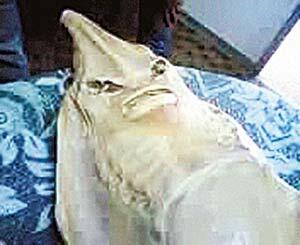 “Jenny Haniver”. By complete coincidence, I decided to look up the name of a fictional airship from the book Mortal Engines. “Jenny Haniver”. honest to god its a type of stingray! i swear i saw a show on animal planet and they had some fish that looked exactly like this and it turns out its a stingray! the picture is true, there is alot.. it’s commercial name is guitarfish, go to google and type, guitarfish, u all will find about it..
Faizal is correct- it’s a guitarfish. I have caught dozens of these off the coast of southern California and northern Mexico. They are quite common in the shallow coastal waters of this area. Russian people just lay the fish on the bed… maybe sleepin with them too. Oh no! It looks exactly like as my uncle Steven!